Member Reviews: Review The Realm Online Yourself! The Bottom Line - For the money, the Realm stands out as one of the best lesser-known MMORPGs. Experienced MMORPG gamers usually started playing MMORPGs with titles like EverQuest and Ultima Online. Presently, most players are getting their first MMORPG experiences with games like Dark Age of Camelot, Asheron's Call 2, Anarchy Online, and the aforementioned EverQuest. Well, the Game Ogre started on a little MMORPG known as the Realm Online. While it was one of the first in the genre along with Ultima Online and Meridian 59, the Realm never received the publicity of those two other genre pioneers. Mainstream following or not, this massive multiplayer game has a lot to offer gamers who don't want to pay $10 to $15 a month for a MMORPG. Besides the low monthly fee of $4.95, the gaming world resides entirely on one server so players know each other better than larger scale games on multiple servers. The somewhat small game play area, which consists of teleport stations in each city, bolsters the strong sense of a community even more. This tightly-knit world yields itself well to an excellent trading environment. For instance, fun events such as auctions and trivia for treasure can be held on the main trade channel or in one of the city chapels made for weddings. One of the strongest aspects of the game play is the character creation. 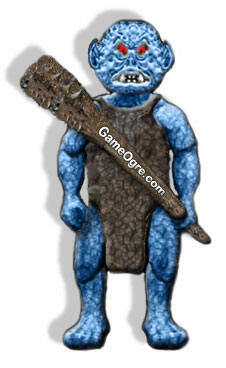 Each player can choose one of three races: humans, elves, and giants. Each race has its own strengths and weaknesses when it comes to skill points. For example, if you want one of the strongest magic users in the game you have to choose an elf wizard and max out his or her intelligence. If you want the warrior that does the most damage in the game, you have to choose a giant warrior and max out his or her strength. The three races and the multiple professions make for some interesting combinations like having a human wizard who can perform magic and fight. However, the Realm's character creation system also hurts the game by being too unforgiving. If you make a character and spend a lot of time on it, the last thing you want to find out is that you made a mistake at character creation that will limit the success of your character. This unforgiving creation system along with the fact that combat is turn-based, make up the two biggest negatives of the game. The turn-based combat system lends itself well to players with bad connections, but it does get old and could be a major reason why the game never gained mainstream popularity. That said, the Realm is not without its faults but it certainly offers a lot of bang for the buck if you are interested in a MMORPG with a great community.